As the summer gives way for fall, the daily wash we use requires assisting in the maintaining the complexity and moisture of the skin. The fall air is cooler and drier thus the cleanser to use should vary on seasons. Gel and Foaming cleanser will be ideal for combination skin. The cleaner we use should change in season as for dry skin, gel and foaming cleanser are not suitable for dry skin will leave the skin dry in fall due to cold air resulting in skin breakouts. For dry skin, I would choose to use the body wash that is sulfate free. They are efficient and do not dry. After cleansing, follow up with a lotion that suits your skin for example free oil hydrating lotion for oily skin. In the fall season, we need to moisturize more and more, why? Well, the winter air is different from other summer's air as it comes with cooler dried air. The dry air provides the skin with less hydration and may even withdraw the moisture on your skin especially on a breezy day. For a combination skin, it calls for a different moisturizer. In the fall, a heavier cream will do the trick. Light creams are suitable for the summer season. The heavier will maintain the moisture in the fall season, even for the oily skin type. Most of us have the concept that sunscreens are for summer seasons when the sun is brightly shining. You are wrong. The sun rays still reach the earth even in the fall season. The UVB responsible for burns ad lashes may not reach the surface but the UVA rays that can cause premature aging and skin acne still reaches even in cooler seasons. Skin care protection should be a year-round job. Choose cream that contains SPF to protect you through the fall. The autumn season is busier than the rest of the seasons thus we more prone to stress. 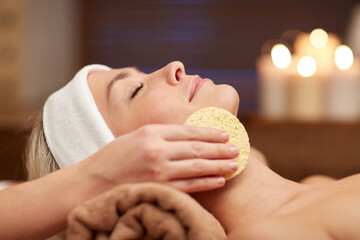 Get more treatment and facials to relax you. Stress results to faster aging and wrinkles formation. The facial care products should be chosen based on the skin type, for example, if you have sensitive skin, choose treatment products that are less on glycolic acid as they cause irritation. PHOTO [email protected] ADOBE STOCK IMAGES.